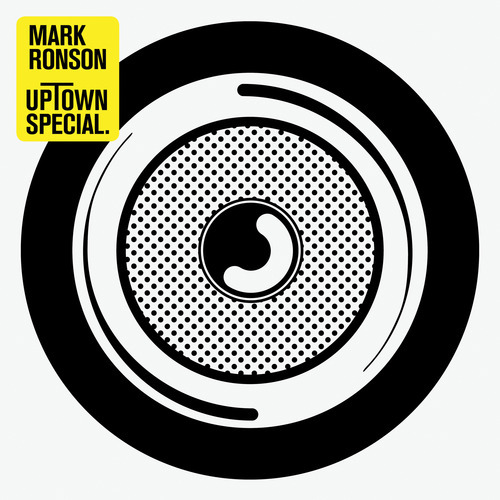 GRAMMY® award-winning producer and musician Mark Ronson will release his highly-anticipated album Uptown Special on January 13, 2015 via RCA Records. It was written and produced with fellow GRAMMY® -winning producer Jeff Bhasker (Kanye West, Drake, Alicia Keys) over 18 months in studios in London, Memphis, Los Angeles and New York City. The majority of the album’s lyrics – although not the lead hit single “Uptown Funk” with Bruno Mars – were written by Pulitzer-winning American novelist Michael Chabon. Ronson’s favorite living author, Chabon became a part of the songwriting process early on and was fully immersed in the album’s narrative creation, often working with Ronson and the vocalists in the recording studio. The global phenomenon, “Uptown Funk” featuring GRAMMY® award-winning superstar Bruno Mars, premiered on November 10th and has already climbed to reach No. 5 on Billboard’s HOT 100, making it Mars’ 13th song in the Top 5, and Ronson’s first track as an artist to break into the Top 5. The single also reached No. 1 in the UK today. PRESS HERE to watch Ronson and Mars perform the song on Saturday Night Live. Tune in to The Voice season finale tomorrow night to watch Ronson and Mars perform “Uptown Funk,” alongside performances by Ed Sheeran, Hozier and Jennifer Hudson. Though Ronson is now based out of London, most of Uptown Special was recorded in the United States with stops in Los Angeles, Memphis and Mississippi. Most of the music was recorded with live musicians with Mark anchoring the sessions on guitar, while surrounded by a complimentary mix of gifted young players and R&B vets. Tame Impala’s Kevin Parker plays a huge role on the album, lending his signature, woozy vocal to three songs, as well as laying drums, guitars, synths and background vocals on other tracks. Longtime collaborator Miike Snow’s Andrew Wyatt also added his wonderful vocals and songwriting talents to the song “Heavy and Rolling.” Ronson & Bhasker’s great friend producer Emile Haynie (Lana Del Rey, FKA Twigs) also provided some glorious sonic landscapes to the tracks. Click the headline to read more! Several musicians, who worked with Mark on his historic production of Amy Winehouse’s multi-platinum Back To Black and his own breakthrough album, 2007’s Version, rejoined him for this album, including drummer Homer Steinweiss, bassist Nick Movshan and guitarist Tommy Brenneck. Also making guest appearances on Uptown Special are bassist Willie Weeks (who played on Stevie Wonder’s classic Innervisions) guitarist Carlos Alomar (who created the familiar guitar riff on David Bowie’s “Fame”), drummer Steve Jordan and Ronson’s personal hero, the legendary Stevie Wonder, who leant his harmonica talents to the record. Also crucial to the sound of Uptown Special are the trippy, emotive vocals of Kevin Parker, leader of the popular Australian indie band Tama Impala. Parker sings lead vocals on three songs on the album (“Summer Breaking,” “Leaving Los Feliz,” “Daffodils”), while also contributing backing vocals, songwriting and drums on one song. While much of the music was composed in Los Angeles, a fateful road trip across the South helped shape the album’s final form. With “I Can’t Lose” Ronson knew he had a record with the punchy groove of a real ‘80s New York club jam that demanded a young Chaka Khan on the lead vocals. But where was that voice today? Bhasker suggested they take a Southern road trip, feeling sure the voice they were looking for could be found in the country’s heartland. Starting out of New Orleans, where they began work on the producer/writers drove down into Mississippi and visited churches throughout the region before landing in Jackson, where they held an audition at the Penguin bar on the campus of Mississippi State University. In walked Keyone Starr, “a cool looking girl with an amazing rasp in her voice,” Ronson recalls. She agreed to come to Memphis to take a stab at recording. Though she had never been in a studio before, under the guidance of Mark and Bhasker, Starr truly blossomed, adding soul powered vocals to “I Can’t Lose,” and background vocals to “Crack In the Pearl”. The funk really flows on Uptown Special. “Feel Right” is a neo-James Brown jam with a killer hook written by Bruno Mars and his longtime writing partner Philip Lawrence. New Orleans’ MC Mystikal brings his roaring rambunctious voice to the track, bridging the gap between hip-hop rhyming and old school soul shouting.